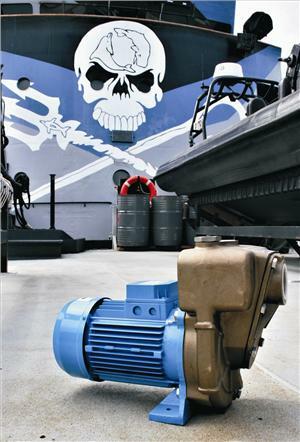 Marine conservation group Sea Shepherd has recently installed another Aussie GMP bronze pump from Australian manufacture Australian Pump Industries, commonly known as Aussie Pumps. The unit is fitted to the M/Y Steve Irwin and forms part of the updated seawater sewer system. Brian Race from Sea Shepherd Global chose the Aussie because of its high-quality nickel aluminum bronze construction and open impeller. The open impeller will handle salt water with small compressible solids. Any installation of 2" pumps will operate with 2 meters of head with a delivery branch that will reduce to 1.5" to allow a discharge at a slower rate. The supply tank is mounted 500 mm above the location of the pump so suction is not an issue. The medium will be salt water and human discharge and is well within the pump's capability. Australian Pump upgraded the material specifications of all their bronze range to nial aluminum bronze. Other materials in similar applications are subject to failure due to early corrosion. Australian Pump supplied the Aussie GMP model B2KQ-A 2" x 2"pump with a capability of providing flows up to 600 lpm. The pump's suction capability has a vertical lift of 6m and delivery head maximum of 20 m. The pump is a neat fit, compact in design with the installation taking place at Williamstown. The M/Y Steve Irwin is an Island Class patrol vessel originally built in Scotland by Russell & Co in Aberdeen. It was built for the Scottish Fisheries Protection Agency and served in that application until 2003. The vessel, originally M/Y Robert Hunter, was renamed in honor of famous Australian conservationist, Steve Irwin, "The Crocodile Hunter", who had planned to take a Sea Shepherd whale defense voyage before his death in 2006.